When I woke up on Friday 27th January, I did not think that in a few hours I would be smoking a cigarette on the roof of the Bank of Iraq. There was social media callout: meet at the Bank of Ideas on Sun Street to walk to a new occupation. The purpose: to continue the work of the Bank of Ideas on a new site. After 10 weeks of occupation, the Bank of Ideas has delivered over 300 lectures, seminars, and events from the likes of Caroline Lucas MP, Mark Thomas, Jeremy Hardy, Thom Yorke and Massive Attack. The buildingâ€™s owners, Swiss bank UBS, have won their attempt to evict the Bank of Ideas from their premises at Sun Street. As imminent eviction is awaited, a new location is sought to continue the work, including the Free University Campaign. At Sun Street, I joined an affinity group of 4, and we set off to Rafidian Bank, 7-10 Leadenhall Street. We were invited in through the high steel gate on Whittington Avenue, walked up 7 flights of the fire escape, and into the Bank through an open fire exit door. Once inside, we set off in all directions to explore. There were many offices, lots of mahogany, dark corridors. There was a hexagonal security desk in one room with many button filled panels; on the surrounding walls, brass plaques inscribed with New York, London, Paris â€“ the clocks long since removed. It was exciting, to think of what could be done with this enormous and beautiful space, which had been empty since before the Bankâ€™s liquidation in 2008. But within hours, the police returned in force and declared they would evict anyone inside the building at 1745hrs under Section 9 â€“ claiming thatÂ although the Bank was being liquidated by PwC, it retained its former diplomatic status as Iraqi Embassy. Media and protestors were asked to clear the area, and then forcibly removed. Finally, the whole of Leadenhall Street was evacuated by the Fire Service who claimed they had been notified of a strong smell of diesel in the building. After a tense standoff, three arrests, lots of unnecessary pushing and shoving from the police and a small General Assembly we agreed to leave. 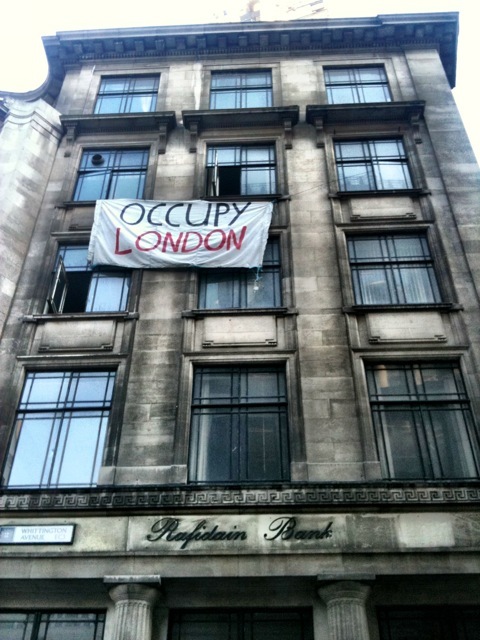 The Rafidian Bank now remains empty, rotting on its foundations whileÂ the search for a new Bank of Ideas continues.